SKOKIE, Ill. (WLS) -- A Skokie veteran finally received medals for his service during WWII on Friday. 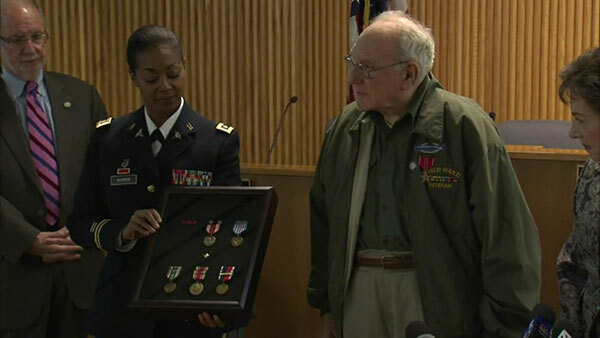 Milton Kaplan, 91, was presented with the eight medals and honors all these years later, including the Bronze Star. Like U.S. Army veterans everywhere, Kaplan is humble when talking about the war. "We expected nothing more than 'thank you' when we left, this is beyond what I ever believed," Kaplan said. Congresswoman Jan Schakowsky helped make the ceremony possible after Kaplan's daughter contacted her office, saying she believed Kaplan may have been eligible for several honors he never received.